SpeedwayPlus | Book Review: The Complete A-Z of Post-War British League Riders by Matt Jackson and Hugh Vass. 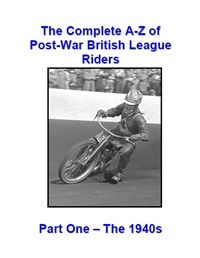 Book Review: The Complete A-Z of Post-War British League Riders by Matt Jackson and Hugh Vass. There have been an incredible number of speedway books published in recent years, many of which we've been fortunate enough to feature on the site, but none of these can have entailed as many hours research as this one. The Complete A-Z of Post-War British League Riders is a book that has been many years in the making. Authors Matt Jackson and Hugh Vass have painstakingly collated and analysed the results of every meeting since 1946, established biographical data for each rider that competed and uncovered enough detail to write a short piece on even the most obscure riders. This is quite unlike any other speedway book as it's only available in electronic form - as a PDF (Adobe Acrobat) file that's shipped on a CD. The reasons for doing this are sound - it's simply too big to publish as a traditional book. This first volume in the series runs to 393 pages alone, making it prohibitively expensive to publish and sell without asking for an extremely high cover price. Sadly the ability to print the file been disabled, so it doesn't seem possible to produce your own physical copy. Obviously reading a 'book' on a computer screen is not everybody's cup of tea, but the PDF format does make it possible to 'search' the book for terms or names of particular interest. This first volume covers every rider that made their league debut between 1946 and 1949. Obviously these four seasons saw more post-war debutants than any other four season spell. The information contained within the book reaches far beyond those years and goes up to (at least) 1975 when Ken McKinlay ended the career he started at Glasgow in 1949. Obviously this means that 'Hurri-Ken' will not appear in future volumes of the book as his full career is covered in this one. It's not only legends like McKinlay that feature in the book, indeed the first entry is an Arthur Abbott, who made just two appearances for Cradley Heath in 1947 before retiring after a crash at Wombwell. That single entry demonstrates just how thorough this publication is, it contains absolutely everybody. Each rider biography contains a season-by-season breakdown of clubs, points and averages - much of this information having been properly calculated for the first time. The vast majority of entries also record the place and date of the rider's birth (and death where it's sadly necessary). Photographs from the John Somerville collection beautifully illustrate the book throughout and add tremendous value in their own right. One imagines that many of these photographs will not have been published for many a year, and indeed may never be so again. This book has immediately established itself as one of the sport's leading reference sources. Once the other volumes are available it will undoubtedly become THE essential reference. That's not to say it's solely a reference book, it's an enjoyable read for both those who read cover-to-cover and those who prefer to dip in and out. Matt has kindly allowed us to publish some sample biographies to demonstrate the style and content of the book. These are of Junior Bainbridge, Keith Gurtner and Len Read. You can view these (as a PDF file) by clicking here.